When Movistar’s Alejandro Valverde attacked to win the second stage of the Vuelta a Murcia, at the top of the steep climb to the Alto Santuario Virgen de Araceli, the first rider to give chase was Katusha captain Denis Menchov. 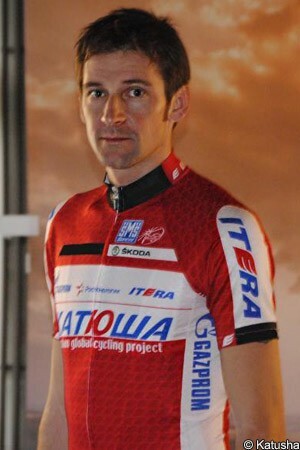 Unfortunately for the Russian, he was unable to get on terms with the Murcian rider, but managed to outsprint Cofidis’ Rein Taaramäe and RadioShack-Nissan’s Fränk Schleck for second place, just ten second behind him. The result - which sees Valverde move into the race lead - puts Menchov in fourth place, 14 seconds down, but only six seconds behind Saur-Sojasun’s Jérôme Coppel in third place, and eleven behind Taaramäe in second. More importantly for Menchov though, with his season’s targets coming much later in the year, he is happy with where his form is right now. "In general I'm satisfied with today's result,” said the Russian. “Obviously I prefer to win but this second place is really not bad. “With the team we studied a strategy in order to take a good position at the end of the last climb,” he explained. “My teammates did a great job; unfortunately, Valverde's attack was too strong for my shape at this period of the season. Anyways, I kept my own pace and thanks to this I could reach a good podium place. “I feel in a good condition, my shape is improving,” Menchov added. “I think I'm following a good schedule, so I'm optimistic for the rest of the season." Menchov’s main target this year will be the Tour de France where, with almost 100km of time trialling, the course suits him better than ever. With the retrospective disqualification of Alberto Contador this month, the Russian is elevated to second place in the 2010 race; after having missed out on an invitation to last years edition - as part of the Geox-TMC team - Menchov will have a point to prove, and will doubtless feel he has a good chance of moving up one more step to the top of the Paris podium this time.